Shutters beautify a home to a whole other level; impressive, to say the least. Aside from beautiful functionality, the richness in look and feel is undeniable. Window treatments that are sure to turn heads and dance upon eyes can be found in the robust selection and service offered by Cadillac Window Fashions. We’ve been adorning windows in homes and businesses with excellence throughout Ontario since 1985, and we don’t settle for anything less than our best for each and every client. Shutters not only titivate a space, they also add value to your home and are an attractive enhancement feature when reselling. It is most beneficial to you that a Cadillac Window Fashions design consultant provides you with a free quote in your home or business where you require the window treatments. By seeing the windows covered our designer is best able to provide you with the most favourable options for the look, feel and budget that you desire. In addition, they will have the opportunity on-site to obtain the exact measurements to give you the best quote and thus, if you decide to purchase, the perfect fit installation, where the walls just seem to melt into the shutters on your windows. There’s only ONE way to install shutters of any style: PERFECTLY. Utilizing the precise measurements provided by our design consultants, our highly skilled installation team pays passionate attention to detail so they fit to function with seamless precision. The personal service provided by us at Cadillac Windows Fashions allows for perfect fit and client satisfaction. Our sales and service are of the highest quality that we demand of ourselves. Visit our website or contact us today to have one of our design consultants come to see you and your windows. Find us on Facebook for exciting décor ideas and latest treatment styles in wood shutters and more! Better yet, come out to our showroom in Woodbridge where you can see and feel the plethora of window treatments we have available to suit your needs and desires. You’d be surprised at how affordable and accommodating we are. We derive much enjoyment from our customer satisfaction, and we’re always excited to show clients options they never would have thought of and resulted in exceeding their expectations. We’ve been enjoying what we do for over three decades, and our enthusiasm isn’t wavering as we discover more for our clients. It certainly pays to conduct business the old school way, personable, face to face, even though we are on Facebook and are able to provide free quotes by email via our contact page. We are a premier Hunter Douglas Gallery dealer offering the very best in contemporary window fashions. 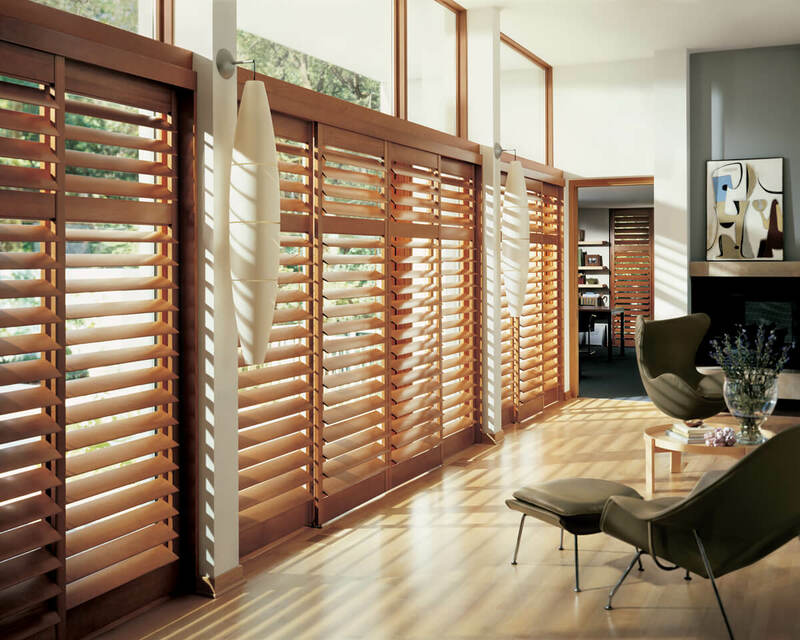 We offer an extensive array of shutter styles, materials and options to choose from. Our installation team is highly skilled at fitting all types of shutters on a plethora of windows and doors. Service, installation and top quality product is what has kept Cadillac Window Fashions successful in pleasing clients for over thirty years in Toronto, the GTA, Woodbridge, Mississauga, Scarborough and much more. We look forward to adorning your windows and doors with excellence this year!